“I started my journey with permaculture in 1999. On my permaculture course I was very inspired by how we were taught, and it awakened in me a whole load of creativity and eagerness to be part of solutions for the world. Then over the years, through then starting to teach permaculture I realised that permaculture was more than just gardening and it could be used to really transform our lives and transform our relationships and turn us all into happier, healthier people. Alongside this the other thing that inspired me to write the book was the realisation that it’s often the people things that trip us up when we’re trying to do projects. It stalls our Earthcare work when we get trapped in people politics. In permaculture design we try to turn around the limiting factors, so if we’ve got something that’s limiting us it becomes one of the aspects we pay attention to in our design. That led me to think – how can we use the permaculture principles and design in all areas of our lives? There hasn’t been very much written about it, although there have been a lot of permaculturists that have thought about it and even used it in their permaculture diplomas, it hasn’t been written about before explicitly so, I took on that project. That seems extraordinary doesn’t it, that permaculture has been around for about 30 years and has always explicitly been framed as being about Earthcare, Peoplecare and Fair share, but it’s taken 30 years for the first book to come into print about the Peoplecare aspect of it? Why do you think that is? I don’t know. It was quite a challenge to write it and believe in myself enough to write it. One of the first things I needed to do was reframe this belief that I needed to be a perfect person to write about Peoplecare. I had to reframe that otherwise I would probably have never written the book. I wonder if that was maybe the case with other people, that no-one quite felt they had enough people skills to write the book! It seems to be a controversial issue, though I’m not fully understanding why, because every single one of us is involved in people care whereas not every single one of us is involved directly with earth care. By paying more attention to the people care we’re actually opening up permaculture to a lot more people and making it more relevant. I don’t know why people haven’t written more about it actually. Do you think it could be said at the approach you capture in the book is a more feminine, intuitive approach and it’s maybe – given that permaculture is something started by two men, with the predominance of teachers being men – that it’s taken women a longer time to find their voice within permaculture? I think it has taken women longer to find their voice and I remember my permaculture teacher, Pippa James (now Johns), saying to me that she became a permaculture teacher because someone said to her “there are hardly any women teaching permaculture, we need more women”. That inspired me on my journey as well to become a permaculture teacher and find my voice within that. When I’d written the book I tried really hard to balance out the feminine and masculine and not to go too far down the route of “oh, all we need is to love each other and everything will be fine”, but to actually make it very pragmatic. How do we use the permaculture principles and the design approach as we would if we were designing the land-based systems? If we were designing, for example, a Transition group, how would we go about actually going through that with a pragmatic, systematic approach that enables us to create a synergetic group rather than a group that falls apart through the people politics? I did try and balance out the masculine and feminine in there, but I agree that a lot of permaculture thus far has been very much focused on the design side of it. For somebody listening to this who’s involved in their local Transition group, how can the tools you’ve pulled together in the book help them? What will they find that will be useful to them? I think there’s several different levels in which it could be useful. The first is on the personal level, looking at our own beliefs, our own patterns and needs and thinking about how those affect our behaviour. Our whole internal landscape affects our behaviour and at the moment we’ve got certain patterns that we follow through. If we’ve got the need of food, the pattern is we go to the supermarket and we might buy something that comes from abroad and it’s a pattern there that we have for fulfilling our needs. These things have to shift as Peak Oil comes around and we’re having to build in more community resilience and live more locally. We all have emotions that go alongside these shifts and alongside going through any transitional state. There can be learning around this. A lot of us in today’s society are afraid of living without technology. We’re no longer afraid of technology, we’re more likely to be afraid of living without it. All of these things hold us back in moving forwards into this life and sustaining culture that Transition is guiding the way towards. So on that personal level, which also echoes out into our collective beliefs, there’s a lot of information in there on how we can become more aware of that and how that is speaking to us and guiding it, how our inner landscape is directing us. So that’s the first level. The next level, I would say the most useful, is to fit in how we operate as groups. I think this is really key to the Transition movement – how we can work well together, how we can make decisions together, how we can hold meetings that are actually fun and productive. This is definitely one of the weak spots of Transition. I know quite a few of the initiatives and groups have struggled with this and maybe haven’t been able to do the actual work that they’d like to because they’ve been caught up in this kind of people politics. Then there’s also looking at it on a bigger level. I’ve taken it out of the book on different parts. The next part is how do we look at it on a societal level and how do we facilitate cultural shifts, which is what Transition is trying to do isn’t it, it’s trying to facilitate a whole cultural shift of thinking and behaving. Absolutely. That whole people politics thing, as you say, is something that can grind groups to a halt. As a culture over a long period of time we’ve become increasingly individualised and less willing to have those kinds of skills and communicate in that way. Do you feel that actually those skills are easy to learn and can be used in any kind of context? One of the first things is to recognise that they are skills you can learn. That you don’t necessarily walk into a group knowing how to work together, that actually we might need to take a step back and formalise that, somehow become aware of the culture within the group and how we want that to be. How do we want to give voice to everyone, how do we introduce new people into the group, how do we make decisions together. They’re all things that we assume we might know how to do, but we might not all be talking on the same page. So we actually should be saying – how are we going to operate as a group, what is the culture going to be in this group? We can then start to formalise that and learn the skills and then that will help us in the long term as well. Part of this seems to be tempering that energy of ‘let’s just do something!’, that sense of urgency and imperative to just rush out and start doing things, with the need to put some good organisational group foundations under things. That’s something that I’ve observed in Transition as much as in permaculture, that balance between ‘lets just go and do stuff’ and ‘we need to pay some attention to the process involved’. How do you see that balance? That is definitely one of the tensions that occurs. Some people are saying “let’s just get on with the job” and are very task-oriented, and there are some people who are very process-oriented and wanting to slow down. It’s a balance between the two, you don’t want to get caught up all the time in process, and so you need to give attention to both of those. It’s akin to building your soil before planting your garden, so paying attention in the initial stages to your group culture can really pay dividends in the long run. But it can seem like invisible work, like it is building your soil and putting your compost on and leaving that. It’s often easier to do that in the initial stages rather than trying to remedy something when something goes wrong, like saying “oh no it’s all going pear shaped, now what do we do?” It’s a lot harder to interact with it then. How can you describe the quality of being in a group that has taken this stuff on board and being in a group that hasn’t? How is the quality of it different? I think there’s something about the space being held more when the group knows that there is this culture that everyone’s working towards. Every group will evolve a culture, it’s just when you set up in the beginning. When I’m teaching courses we set up a course culture, we say how we would like the group to operate. By having done that, it really opens everyone to being part of the group, and everyone feels some ownership over it, and the ability to say something. That’s something we can come back to “where are we going now, is this in line with where we want to go to?” There’s much more safety and trust in a group that has voiced its culture and voiced what it would like, and that can be a really strong reference point. If someone was listening to this and they were about to run their first meeting of a Transition group, what would your advice be for that first meeting in terms of what tools they might need and how they might use that first meeting to lay the foundations? I think one of the important things is making sure everyone feels like they have a voice. This can be done in very simple ways, by just doing a go-round at the beginning, inviting everyone to say their name, and say something that they feel gratitude for this week, or something that’s excited them – something like this to open up the space for everyone to talk. You can do it in pairs where people listen to each other, so it’s developing our listening skills. Simple tools like that can allow everyone the breathing space and to feel that they can be part of the group. There are other more complex ones you can use as well. I think it’s also worth bearing in mind if it’s a group that’s planning to work together over a long time to say “what are the guidelines we’re going to work by?” For example, what happens when someone isn’t at a meeting? Can we make decisions without them or not? If everyone said “yeah, OK, if I’m not at a meeting the decision goes ahead without us” then you know that that’s what’s going to happen, rather than there being any sort of backlash later on. One of the things I’ve noticed here in Totnes has been that sometimes if we do a big public event, while there’s the person standing up there speaking, everybody will be there listening. But as soon as they have to talk and turn to the person next to them there’s always a good 5 or 10 people who just get up and go. The idea of anything that involves any sort of interaction or intimacy and they’re out the door! There are some people for whom the idea of putting chairs in a circle caused them to recoil as if it’s some sort of mad, cultish activity that’s being suggested. Do you feel that the resources and tools that you’ve pulled together can be used in any situation or any circumstance or not? It’s very interesting and it does highlight the local differences in culture that we have, even in the same town, of who would sit in a circle and who wouldn’t. It’s very much up to the facilitator to play that by ear and to see what steps they can take without alienating people. It’s a very fine line isn’t it, between trying to make something that pleases everyone, which in the end probably doesn’t please anyone, or how do we stretch our boundaries, whose boundaries do we stretch? In the end it’s about the aims that we’re trying to achieve. If it’s a public meeting and we’re really trying to talk to everyone, then we’ve got to play it as safe as we can and try to keep everyone on board. If it’s something that’s perhaps more optional for people, we’re really wanting people to be able to work together over time, then maybe we need to go in a different direction. 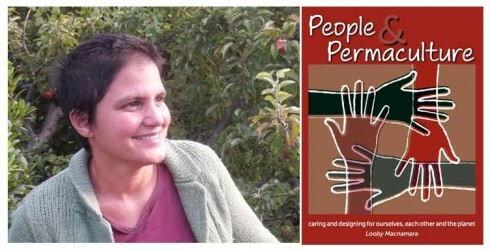 You talked before about how using the principles of permaculture can be of assistance to Transition groups and indeed there’s a section of the book about how they can support Transition. What’s your sense of the other way? 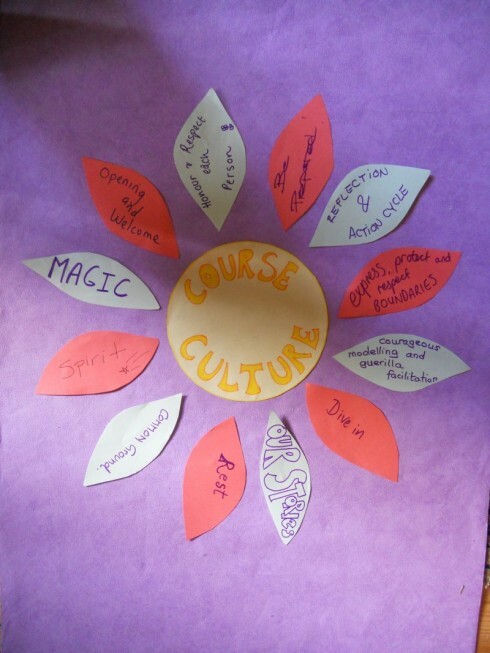 From your experience of being around Transition groups what do you think permaculture can learn from Transition? One of the big things that Transition has done that permaculture hasn’t quite managed to do is successfully spread itself across the globe. Transition’s managed to do that so quickly – it seems to have really spoken to a need in a lot of people and given them tools to work quickly on that and come together. I think it’s been a great gift that Transition has brought and something definitely that permaculture can learn is how Transition has managed to spread so quickly. Perhaps the word ‘Transition’ is more recognisable to people as a word in the English language than the word ‘permaculture’… what’s that?! I think it’s been very interesting watching how quickly Transition has spread and I think it’ll be very interesting to watch how Transition grows and learns and develops over the next few years because it’s still very young really. Is successful campaigning and good activism possible without attention paid to the inner aspects of it? I think all advertisers do look to pay attention to our inner needs don’t they, they talk to us on a subconscious level without us recognising it. I think that when we’re able to do that, when we’re able to really talk to people and shift mindsets, then that’s quite powerful. I think that’s something that both permaculture and Transition do, is try and talk to people from an abundance mindset, that we can have this abundance in our lives and in our communities. We can work towards the future that we want. Those are really powerful messages, that, if people are willing to take them on board, can really inspire and motivate us. What’s next for you? Where do you go after doing this? I’ve got a few ideas. I’m resting at the moment and waiting to see what emerges. There are a few books that I’d like to write but I haven’t plumped for that, at the moment I’m running People and Permaculture courses so that people can come and learn about design for people-based systems how we can use that creativity of the permaculture principles and design in all aspects of our lives to create the life-sustaining culture that we’re looking for. I’m doing courses this year and hopefully we’re going to find some land and have a training centre for ourselves. 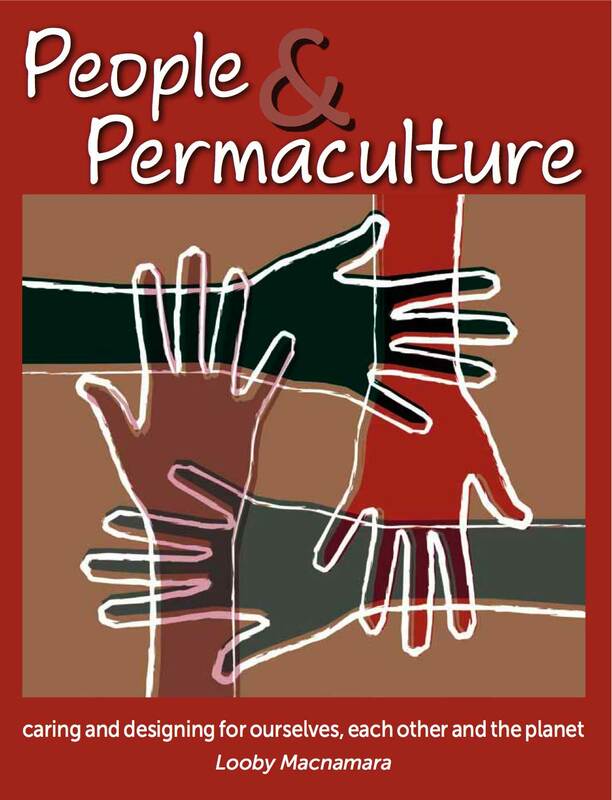 For Looby’s permaculture courses see here. 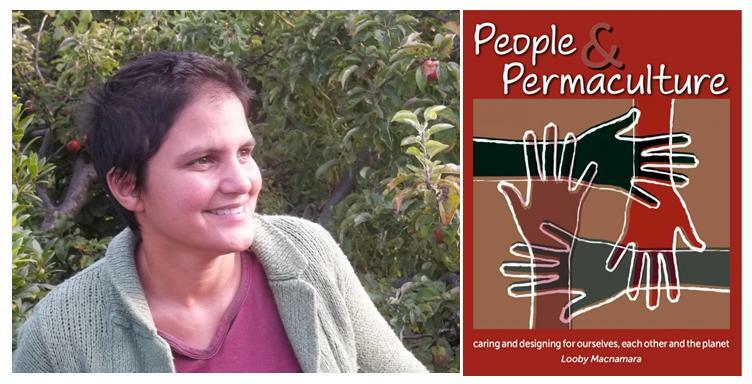 To buy Looby’s book “People and Permaculture- caring and designing for ourselves, each other and the planet” see here. Looby will soon be writing a blog. Great interview! I’m looking forward to reading the book and finding ways to apply it in our Transition initiative!